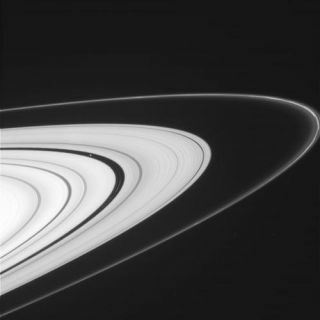 NASA's Cassini spacecraft has recently resumed the kind of orbits that allow for spectacular views of Saturn's rings. This image was obtained on May 23, 2012. The dazzling rings of Saturn are taking center stage in amazing new pictures snapped by NASA's Cassini spacecraft currently orbiting the planet. The new Saturn ring photos come as the Cassini probe moves into a slightly different orbit around its gas giant target, officials with NASA's Jet Propulsion Laboratory in Pasadena, Calif., said in an image announcement. "It's been nearly two years since NASA's Cassini spacecraft has had views like these of Saturn's glorious rings," JPL officials explained. "These views are possible again because Cassini has changed the angle at which it orbits Saturn and regularly passes above and below Saturn's equatorial plane." The new view allows Cassini mission scientists to better study the shifting motions and intricacies of Saturn's rings, as well as the small moons that shape the rings. Three Cassini images show a propeller-shaped structure created by an unseen moon in Saturn's A ring. Saturn's rings are visible for the first time in two years, as Cassini spacecraft moved out of Saturn's equatorial plane in the spring of 2012. With Cassini in the new orbit, the mission team has revived a project aimed at studying odd propeller-like shapes in Saturn's rings, JPL officials said. The propeller features appear as parts of the rings are swept clean by strange particles that are larger than the actual ring particles, but smaller than the known moons of Saturn, they added. The Saturn ring propellers have not been seen in recent years because Cassini's orbit did not allow favorable views of the planet's rings. Since Cassini entered its new orbit, however, scientists have spotted propeller features that appear similar to ones observed in the past, NASA officials said. The orbit change will also allow Cassini to observe Saturn's polar regions while gaining a new perspective on the planet's many moons. "We're entering a new episode in Cassini's exploratory voyage through the Saturn system," Carolyn Porco, imaging team lead, based at the Space Science Institute, Boulder, Colo., said in a statement. "These new ring results are an early harbinger of great things to come." Cassini has been orbiting Saturn since it arrived in 2004. The spacecraft launched in 1997 is currently in an extended mission expected to last through 2017. Views of Saturn are not limited only to Cassini's camera eyes. The planet is currently shining bright in Earth's late-evening night sky and can even be seen with the unaided eye, weather permitting. Saturn and Mars are both visible in the western sky in late-evening. The two planets can be seen near the bright star Spica, weather permitting.